Also find out if the stores you visit have a lay-a-way plan to make paying for your nursery rug more manageable. Now it's time for the power of the internet. Here are a few online stores I found to get you started. These stores have specials or clearance sections, as well as, regular sales. Visit as many online baby stores as you can find. Check which ones carry nursery room rugs that fit with your nursery design. Sign up for the newsletter on these sites. The newsletter will inform you of upcoming sales and specials. If the site does not have a newsletter, check back often to see if there is a sale. Some online baby stores have a clearance or specials section where you can pick up bargain nursery area rugs. Check these often for the nursery rugs you are looking for. Amazon's Baby Room Rugs Section offers a wide range of discount nursery room rugs, many with free super saver shipping. Get up early and make sure you get there for the start of the sale. If you can find yard sales listed in your local newspaper, phone ahead. Some people will let you reserve a nursery rug that you are interested in. While you are there, check out other items that may work in your baby nursery. Borrow a nursery rug from a friend or family member. You will want to get it dry cleaned to get it ready for your baby. Remember to take shipping costs into account when you are doing your price comparisons. Some online stores offer free or low flat-rate shipping. This is a huge saving! Buy the right type of baby room rug. Natural fiber rugs usually cost more than synthetic fiber rugs, with wool being the most expensive. Hand-made rugs are more costly than machine-made rugs with good reason. A good hand-knotted rug can take more than a year to complete. The denser the weave of the rug, the better it will wear and the more it will set you back. The tighter the yarn twist, the more expensive, and the more durable the rug will be. Because the baby nursery is a low traffic area, with decor that will change on a short-term basis, durability needn't be at the top of your priority list. A natural fiber baby room rug is only necessary if you are worried about allergies. If you do want a natural fiber nursery rug and your baby nursery budget is limited, opt for a rug with lowish density and yarn twist. Get over 60 cheap nursery decorating ideas to help stretch your baby budget! Every dollar counts! 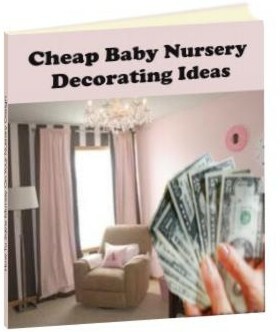 Don't forget to visit the nursery decor bargains page for more money saving information. 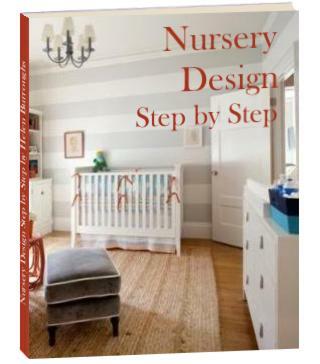 If you're having trouble getting started with your baby room, don't miss my FREE Step by Step Nursery Design eCourse. One at a time I'll take you through all the decisions you need to make in order to arrive at the best baby room design for you.